Nicolas DiLorenzo, UF/IFAS Beef Specialist, introduced the UF Hay Balancer decision-aid at the 2018 Northwest Florida Beef Conference in Marianna. 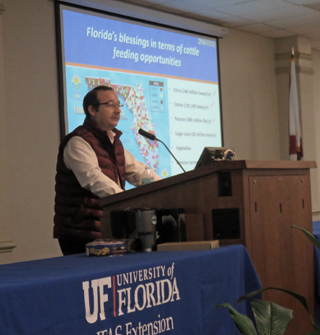 At the recent Northwest Beef Conference conducted in Marianna, Dr. Nicolas DiLorenzo, UF/IFAS State Beef Specialist, introduced the UF Hay Balancer, a spreadsheet that can be used to calculate the most cost effective way to supplement cattle through the winter. The UF Hay Balancer is a decision-aid tool created by the University of Florida, Panhandle Ag Extension Team with the objective of developing cost effective winter feeding programs. Winter feeding strategies for beef cattle in the Southeastern U.S. almost always include the use of hay as the base feed. However, the majority of the forage species used to produce hay in this region are warm season perennials, which can be quite limiting in terms of nutritive value. Typically, when you compare the nutrient requirements of beef cows to those provided by the hay, there is a need for additional supplementation of energy (TDN), protein, or both. The Panhandle Ag Extension Team recognized the need for a decision-aid tool to assist producers, researchers and county agents, with ration balancing using the results from a hay test. Once you have determined the quality of your base hay, the UF Hay Balancer allows you to compare a variety of by-product feeds to determine the most cost effective blend to feed your herd each day. Not only does this help you figure out what to feed, but also how much total hay and supplement will be required for the described feeding period. It is somewhat challenging to completely describe in an article how this tool works, so just follow the basic instructions below and give it a try. There is no charge to download this helpful new tool. Enable the use of macros clicking on the “Enable Content” button in the yellow ribbon on top of the file (see image below). Instruction for use are quite simple: you can only change the information in the orange cells. Nothing else, other than orange cells, or the drop-down menus can be modified in this file. At the “Home screen” tab, enter all your inputs. For example: average cow weight, whether she is lactating or not, type of hay to use, and more importantly, a current hay analysis. See image below for information on where to enter that information. Select the estimated hay-feeding waste from the drop-down menu. You have the option of selecting: None (0%) for a situation without any waste, low (10%) – such as a hay trailer or sheeted bottom hay ring, moderate 30% open bottom hay ring, or high (50%), if hay is fed on the ground without a hay feeder. Click the green button to go to the feeds library to check for accuracy on feedstuff information such as prices or nutrient composition. Alternatively, the user can click the blue button to go directly to the Balancing and Summary page. 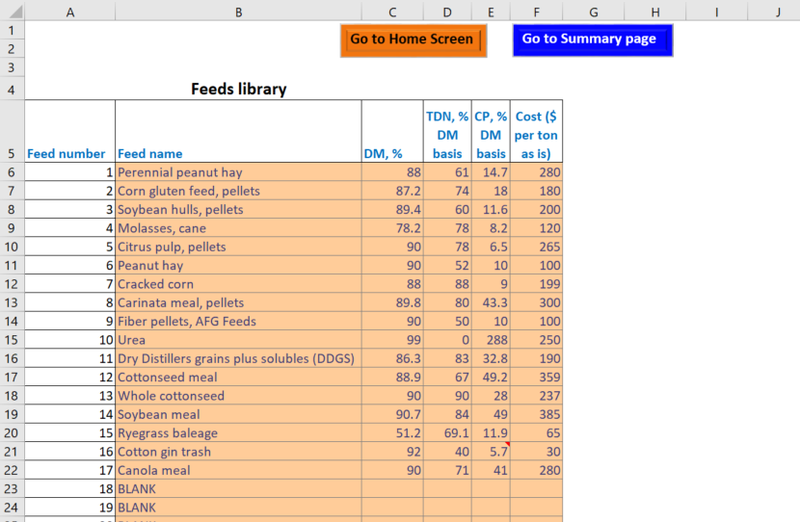 At the Feeds Library tab, new feeds can be added or modified, changing price and nutrient composition to fit the most current analysis or price quote. Up to 200 feeds can be added to the library. Any orange cells can be modified. Clicking any of the buttons on the top, the user can go back to the Home page to change hay analysis or cow requirements, or go directly to the Summary page. 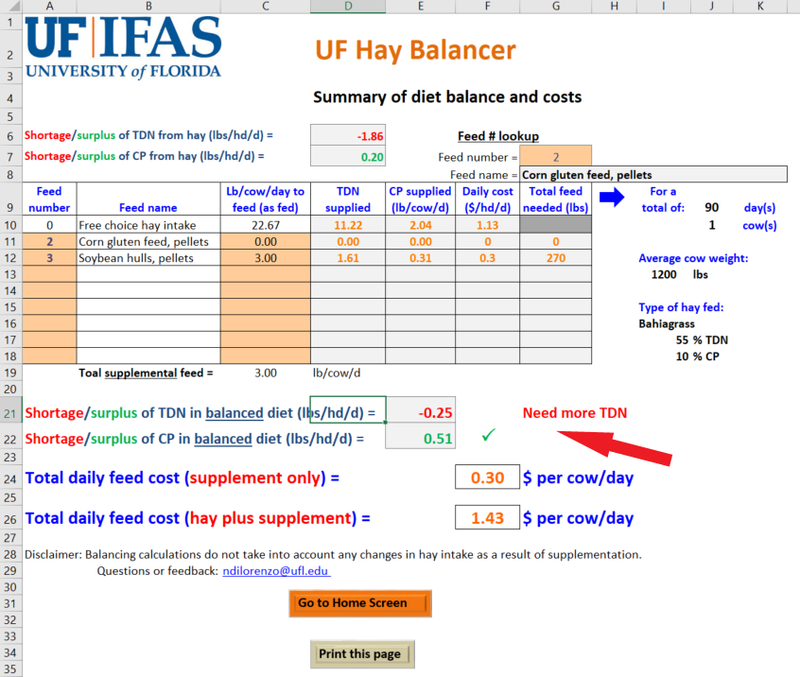 To perform the final balancing of nutrients (if needed), the user can go the Summary and Balancing page (image below). In this final page, the user can enter the amounts of feed to supplement and the program automatically calculates nutrient shortage or surplus. When either TDN or CP are needed in order to meet the cow’s requirements, a red sign will display indicating “Need more TDN” or “Need more CP”. If the requirements of either nutrient are met, a green check-mark will be displayed next to the corresponding nutrient. Note that feeds can be selected by entering the Feed number in the corresponding box. The user can find the feed numbers either on the feed library tab, or by using the “Feed # lookup” feature on the top corner of the screen. Add the desired amounts of each feed to supplement and watch the nutrient balance change in the bottom of the screen, as well as the daily cost of supplementation. To print the final balanced diet, click the “Print this page” button. A separate window will open allowing to save the calculations as a pdf file or to print. Note that this final “Summary page” contains all the necessary information in terms of supplementation costs, cow average weight, hay analysis, and total feed needs to purchase for the entire feeding season. To modify the inputs, the orange button (go to Home Screen) will take the user to the initial screen. On behalf of the Panhandle Ag Extension Team, we hope cattle ranchers will find this new interactive tool useful. This is by no means a complete ration balancing program, but it is a very helpful tool to identify by-product feeds that can supplement the missing energy or protein in the hay you feed to your herd. If you are not familiar with using Excel Spreadsheets and need assistance, contact your local County Agent so they can help you work through the instructions above. 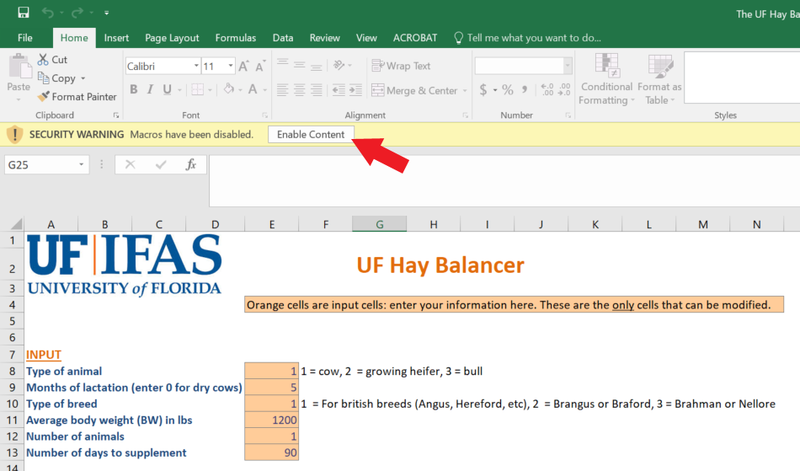 If you have feedback or suggestions, for improving the “UF Hay Balancer” please email Dr. Nicolas DiLorenzo.